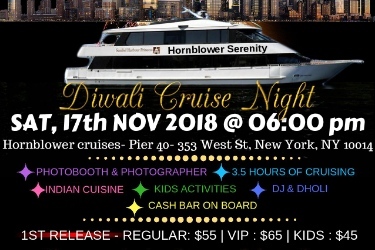 ApneeCommunity is proud to add 'KJ Entertainment Presentation - Diwali Cruise Night 2018' to the list. This upcoming event is an ideal package of Diwali celebration & Cruise party. Were you searching for 'night party events near me'? Well, if your answer is yes, then this desi event is definitely for you. Just take a moment & think about the amazing house parties you had with the bunch of your favorites. They seemed like the best thing ever, right? But seriously, cruise parties can beat them any day. In fact, cruise night parties are the great way to experience more of the world without doing much on your part. 1. Delicious dinner & 2 full bars on board will be available to enjoy exotic drinks. 2. There will be non-stop Bollywood music and Dhol. 3. You can also get a Family Photoshoot done by Jyoti Bhuvanraj Photography. 4. The cruise you will ride is an Ultra Chick Modern Cruise in NYC with a 360-degree view. Furthermore, the cruise has weather controlled decks. 5. Most of all, it is a family event and kids above 5 are allowed on board. You will not only relish the sailing experience but also rejoice in the moments of this night party. So, are you ready to experience this new clubbing trend? Book your tickets in advance to avoid any last minute hassles! It is strictly a 21+ event. You should carry valid ID proofs for the admission purpose. In case, you will fail to present a valid ID proof, you will not get the admission. Also, you won’t be eligible for a refund in any such circumstance. 1. All kids below 18 will need a ‘Kid Admission Ticket’ to board the cruise. 2. Boarding will start at 6:30 PM and the cruise will depart at 7:00 PM sharp. In case you miss, you miss the fun. No one will be responsible for the same. 3. Food will be available for the first hour only! Visit us to explore more 'upcoming events near me'.